Now if there’s one thing I miss since being diagnosed coeliac, it’s being able to easily feast on a big fat burger. Given my wife is vegetarian, it’s not something I really make at home unless we are having a barbecue. Having been to the fabulous Honest Burgers in London I have been dreaming of finding somewhere in Plymouth that will do a burger of that quality, and more importantly a gluten free one. Last year I saw a tweet that a new restaurant called JD’s Grill was opening in Plymouth, “Serving delicious gourmet burgers and American influenced food”. As usual I did my bit and tweeted them to see if they would be offering gluten free options. They replied to say that they were offering gluten free bread for their burgers. I recently followed this up with an email to investigate further. They replied that they were still offering gluten free bread, and the burgers were gluten free though they couldn’t guarantee that “that the spices etc that we use in our recipe have not been cross contaminated in the factoring process”. However, they kindly offered to make me my very own burger leaving out any spices that were a risk. When my wife spotted a bargain Group On offer (two meals and two drinks for £10) we decided to give it a go. Once seated I mentioned I was gluten free and they immediately knew who I was which was a very reassuring start. The Group On offer included a beer, but they happily swapped this out for a cider. There is quite an array of toppings for the burgers on the menu, though I went for a classic choice of cheese and bacon to top my half pound burger! The person who served us explained that their gluten free buns had unfortunately disintegrated in the freezer (well we’ve all had problems with disintegrating GF bread!) and they were struggling to find a good gluten free bun supplier. However they did have gluten free bread in. Not quite the same, but I appreciated the effort as most places simply will offer you the burger minus the bun anyway. Unfortunately I was advised I couldn’t have the chips, but the wedges were gluten free. I really enjoyed the burger. It was really flavourful and it was a quality burger, I didn’t feel like I was missing out with the other spices taken away at all. The gluten free bread was also good and at least let me demolish this burger with my hands in traditional fashion! The chunky potato wedges were good too and were a fine substitute for chips. My gluten eating vegetarian wife went for the sweet potato burger with wedges and was also impressed. The portion sizes were great and certainly no skimping here. Some of the orders we saw coming passed our table were obscenely big. JD’s also run a Man vs Food style “Goliath Challenge” too for those who are into that kind of thing. Half a pound of delicious meet was enough for me though. With the Group On making it only a tenner for two great meals and two drinks it was fantastic value. Onto dessert and as the waiter passed me the menu he informed me that all the Sundaes were gluten free without me asking. This was the third person who served us during the evening and all three were aware of my requirements when they came to the table. I was really impressed with this. 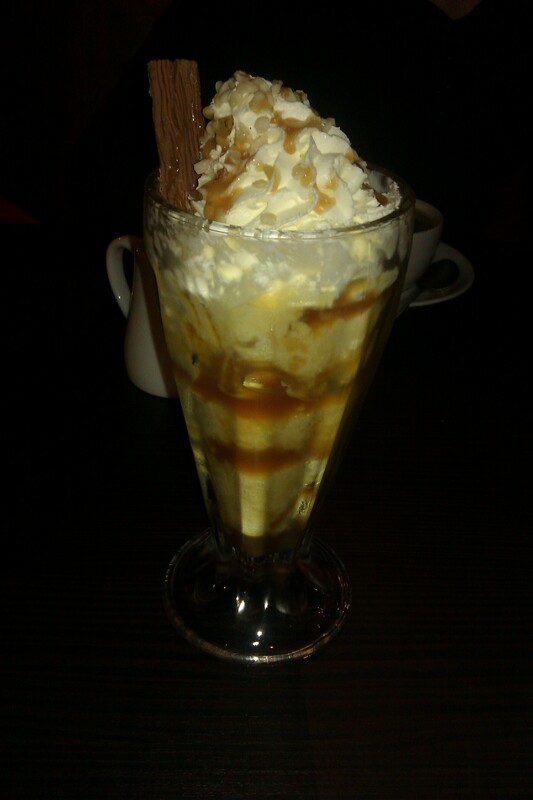 I went for a butterscotch tower which went down well even though I was already completely full. Well I couldn’t really do a review without sampling a dessert. Again a very ample portion size. So overall I was impressed. The staff couldn’t do enough for us all night and were very friendly and accommodating to my requirements, and the fact they had specially prepared a burger for me was very impressive. 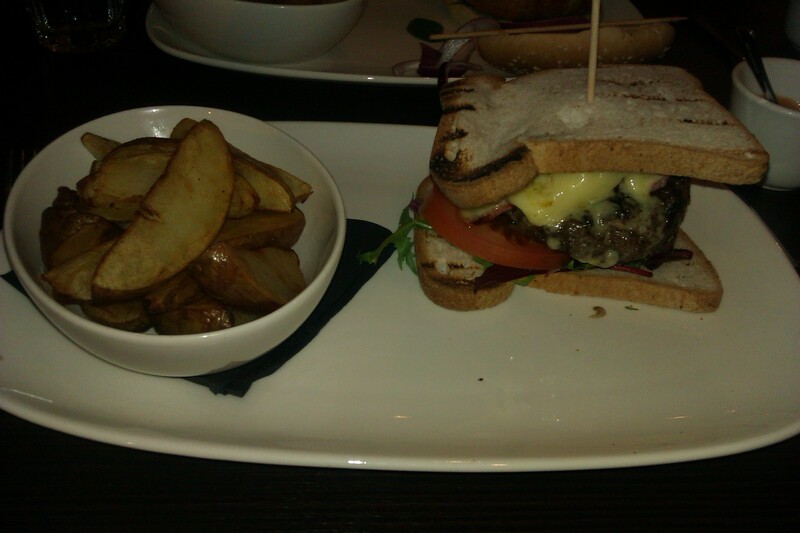 The quality of the food was very good and I’d have happily paid the normal price of £8.95 for the burger. So was it as good as Honest Burgers? Well no it wasn’t, but that is very high bar to reach. The quality of the burger is up there, but Honest is just that bit easier on the gluten free side. I’ll definitely be heading back to JD’s for more though. If they really wanted to push the gluten free boat out then they could get in a gluten free beer such as Celia, and maybe consider marking the items on the menu with a GF. This would be especially helpful with the toppings. OK I’m just being greedy now. So a thank-you to Dave for organising the gluten free burger for me, and all the staff for looking after me on my visit. As Arnie would say, I’ll be back. If you are planning on making a visit you can email JD’s Grill at info@jds-grill.co.uk in advance to discuss gluten free requirements. See here for further offers. Update 25/06/13: I’ve been back for another visit, and this time I got a gluten free bun! 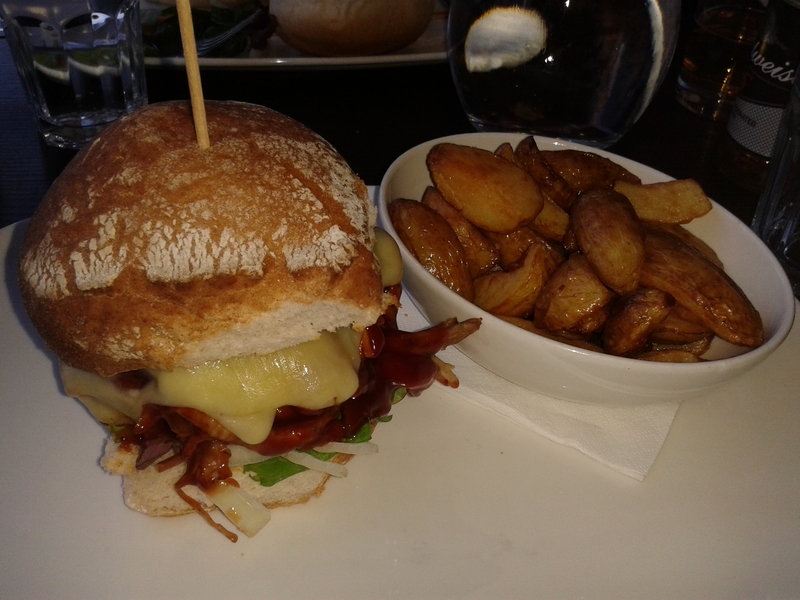 Check out this photo of my AMAZING 1/2 pound burger with pulled pork, BBQ sauce and Monterey jack cheese. Even better than the previous visit and service equally as good too. Great review, Kevin. You’ve got me salivating up here in Lancashire! It’s just a little tooooo far for me to travel for a burger, but I totally get while you’ll eat there again. Sounds like they looked after you very well. Thanks Claire, could do with one now myself! Hope you are well.